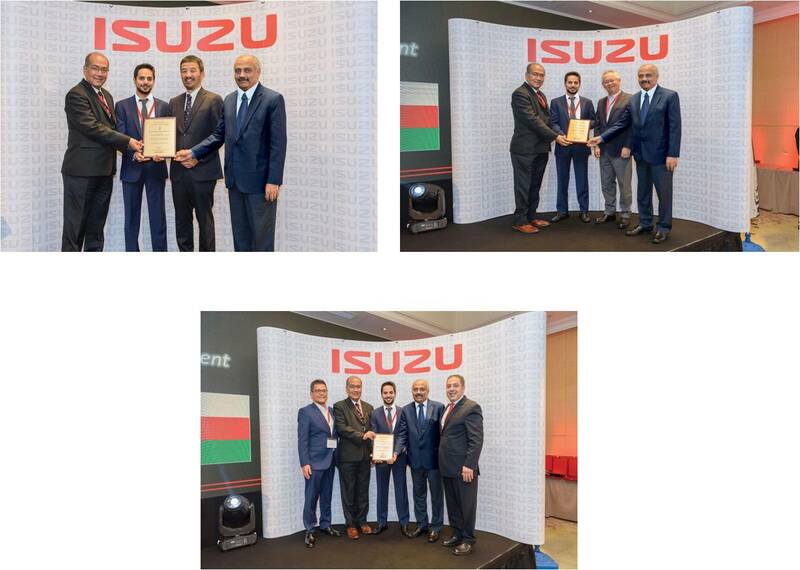 During the recently concluded Middle East & Africa Dealers Conference, OTE Group-Isuzu bagged 3 prestigious awards among other distributors from across the region. These awards are given by Isuzu motors to recognize exceptional dealers in the Middle East & Africa region for their achievement and outstanding results. OTE Group was recognized as the 2nd best dealer in the region for overall excellence in operations and also specifically awarded for sales and spare parts operations. The best dealer award was presented by Mr.Makoto Kawahara, President, Isuzu Motors International to Sheikh Salim Saad Suhail Bahwan, Director, OTE Group, in the presence of Mr.Dilip, CEO, OTE Group and Mr.Malay Saha, Vice President – OTE Group - Isuzu. OTE Group has been constantly focusing on regular training and evaluation of its sales and after-sales teams to provide superior service and utmost care to its customers. Also, OTE-Isuzu service team recently bagged top awards in the Isuzu Middle East Grand Prix Technical Skills competition, is a reflection of the OTE-Isuzu service team’s technical excellence and sharp skills in diagnosis and problem-solving techniques. These honours are a testament to OTE Group’s dedication to enhance the overall customer service throughout their ownership cycle. Many innovative customer centric initiatives are consistently being done by OTE Group to provide creative solutions to meet the fast changing needs of its growing customer base. One such introduction is the two-hour truck service including washing at select service facilities such as the flagship service facility at Rusayl, Barka and Sohar with pre-booked appointments. Also, after dropping their trucks for service at OTE-Isuzu service centre in Rusayl, drivers can relax comfortably in the driver rest room, collect their trucks after service and proceed with their activity, without having to experience the hassle of visiting the service center twice for dropping and collecting their trucks. Isuzu has a wide range of cargo vehicles in Oman, starting from D-Max pick-ups and trucks from 5.5 tonnes to 33 tonnes, most popular being the N-Series - Reward, while the other line-up such as F-series, C- Series and E-series are also widely preferred. All these truck models are very versatile and are being used in a wide range of applications best suiting the customer requirements even in tough operating conditions. The N-Series Reward brings higher performance on every level with styling, power and economical operation along with a host of convenience & safety features. By offering a wide range of GVM, the N-Series meets the larger needs of business with a model that is perfect for every application. Isuzu D-Max is tough, reliable and fuel efficient. It is built on a heavy-duty chassis that has Isuzu’s legendary durability and superior performance, making it one of the most competitive pick-up truck models. Isuzu has also expanded its product portfolio and re-entered the passenger vehicle segment, which it vacated over a decade ago. Isuzu Mu-X, a versatile and stylish 4x4 SUV, designed to perform both on & off road. It has gained wide customer acceptance in the sultanate and is also very popular in many markets across the globe because of its powerful, spacious and luxurious ride. Isuzu Motors Ltd, headquartered in Tokyo, is a Japanese commercial vehicles and diesel engine manufacturing company founded in 1916. Lauded as the world leader in diesel engine technology, Isuzu has carved a niche for itself as a leading manufacturer of medium and heavy duty commercial trucks as well as small to medium compact automobiles. Isuzu is not only present in over 100 countries but also enjoys an overwhelming number one position in many regions. In Oman too, the Isuzu brand is immensely popular because of its unmatched reliability and versatility. OTE group is the exclusive distributor for the Isuzu range of vehicles in Oman, offering excellent sales & after-sales service support on par with global standards with a nationwide service network. For more details, call 800-50004.